You may have missed it this year amid all the arguing about whether Nintendo should bail out of making gaming hardware and just stick to making games. You may have missed it if the only Nintendo headlines that made an impression on you in 2013 were the ones about Wii U struggles or the company's latest line-up of sequels, sequels and, for the most part, more sequels. You may have missed the fact that, this past summer, Nintendo quietly began perfecting a whole new genre of video games that doesn't exist—and may not be able to exist—on any Sony, Microsoft, Android or Apple machine. Nintendo released four games that play differently than any other games anywhere. These games require the exact kind of marriage between hardware and software that Nintendo stalwarts regularly say mandates Nintendo to continue to making gaming hardware—and not just games—in order to do what Nintendo does best: make groundbreaking games. This past summer, Nintendo began perfecting a new genre of video games that doesn't exist—and may not be able to exist—on any Sony, Microsoft, Android or Apple machine. The four Nintendo games I'm highlighting represent nothing less than a radically different way to build and play video games, one that defies traditional singleplayer and multiplayer categorizations and which depends on an odd combination of fuels to make the games playable. They are powered by one of two things: the nearby physical presence of other gamers and/or hours of physical activity by the person who owns the game. To play the StreetPass games and to use the 3DS' StreetPass technology in general, you must bring the system around with you. If you're playing StreetPass games, you're hoping that others are carrying their 3DS systems with them as well. As soon as a person starts using a 3DS, the system invites the user to make a little Mii avatar of themselves and to adorn that avatar in a simple outfit that includes a shirt of their favorite color. They're also encouraged to let their 3DS share StreetPass data as long as its power is on and its wireless switch is activated. Any 3DS that's activated like this will swap Mii data with other 3DS systems if the two machines are within 75 feet or so of each other. The systems can make this data exchange while they are open and running games. They can be closed and resting in people's pockets or bags. They'll still exchange data. They'll send players' Miis into each other's systems and they'll also exchange data for any games that support StreetPass. Notably, other portable devices, including Apple and Android phones and Sony's PlayStation Vita, either don't have or simply don't utilize this kind of non-Internet, passive short-range exchanging of data. That might be changing soon. Just this past month, for example, with the introduction of iOS7, iPhone users could begin to manually "AirDrop" photos, notes and other clumps of data to nearby devices that are eligible to receive such data, but that short-range transfer of data is not quite as automatic and effortless as Nintendo StreetPassing—not yet. Most games that support StreetPass on the 3DS do it as a bonus feature. Super Mario 3D Land, for example, lets people unlock challenge levels in each other's games; Fire Emblem Awakening sends a copy of one player's army into the war map of the other player, letting the receiving player see if they've got a squad that can beat them. In Mii Force and the three other summer 2013 StreetPass games, this data-swapping is the core of the game. Other portable devices, including Apple and Android phones and Sony's PlayStation Vita either don't have or simply don't utilize the kind of non-Internet, passive short-range exchanging of data that powers the StreetPass games. Back to Mii Force, the shoot-em-up that gives you no guns. The game doesn't arm your ship. You don't arm your ship either. The people with whom you StreetPass do. Those people, in fact, are your guns. See, your ship is an orb and in the fiction of Mii Force, up to 10 people with whom you StreetPass will appear in your game as little orbs, too. Your orb can fly. Theirs can shoot. You attach their orbs to yours to make a little multi-gun spacecraft. The kind of weapon each Mii shoots depends on which favorite-color shirt they're wearing. A person who wears a white shirt will shoot buzzsaws. A person in a navy blue shirt fires homing missiles. Someone wearing lime green fires a sort of laser whip. On a day when you know you've collected some Miis via StreetPass, you can crack open the 3DS, load Mii Force, collect the weaponized orbs of the Miis you snagged and shoot through a level of the game. If you StreetPassed with fewer than 10 people, then you'll have fewer than 10 weapon orbs to affix to your ship (you can actually only equip and fire four weapons at a time; the other Mii orbs can be used to amplify the effects of those guns). In the past we've been able to play single-player games, games that we spent a quarter or maybe $60 to access. We played them at the arcade or on a PC or console. We played solo and it didn't really matter if we were the only gamer in the world other than for the fact that, if we were, no industry to make games would exist. In recent years we've seen the rise of a weird and divisive kind of game on Facebook that involves a passive kind of multiplayer. This version of gaming was popularized by the FarmVille studio Zynga. If you played FarmVille, you did so on your own. But if you wanted to get further ahead in FarmVille more quickly, you needed to ask other people on Facebook to help you. These people didn't even have to be FarmVille players. They just needed to be connected to you on Facebook and needed to be willing to click a virtual button to send some materials your way. They might even load a copy of your game and water your crops for you. They were never quite with you, but they helped you along. The "social" Facebook version of video games was different and, for a time, popular, but it didn't really cultivate an interaction between the FarmVille player and their helper friends that many people would describe as "fun." Worse, the FarmVille style of game seemed to nakedly tie this system of "social gaming" to a business model that necessitated that the FarmVille player make as many other Facebook users aware of FarmVille as possible, in the hopes that they too would play FarmVille. Notably, FarmVille players could skip out on relying on friends and just pay money to get ahead, clearly something the company behind the game hoped and needed players to do to stay in business. Players would also see their playing time metered in terms of units of energy and would be unable to make more moves once that store of energy was depleted unless they: 1) waited, 2) asked friends to click things to give them more energy or 3) paid. While a Mii Force player doesn't need other 3DS owners to own a copy of Mii Force—they only need those 3DS owners to have their Miis in a shareable state—they do need other 3DS owners to be out in public with their 3DS systems. They also need to be out in public with their machines, too. Nintendo's StreetPass games aren't just for big cities, though. You can play this summer's StreetPass games without StreetPassing with people. See, instead of using Mii data from other systems, 3DS owners can cash in "Play Coins" to generate virtual Mii characters—generally virtual dogs or cats, depending on which animal the system owner prefers. You earn Play Coins by walking around with the 3DS. The system's motion sensor counts your steps and turns that into virtual currency. See the pattern here? Nintendo is incentivizing players to carry their 3DS systems. They don't want you leaving your handheld at home. See the pattern here? Nintendo is incentivizing players to carry their 3DS systems. They don't want you leaving your handheld at home. A wonderful, if rare case of Nintendo making games that depend on hardware capabilities—in this case short-range passive wireless data transfer—that other machines lack or fail to exploit? Even if Nintendo's StreetPass games are the result of some sort of business plan for selling more 3DS systems... Even if they are cravenly commercial and not borne out of artistic inspiration...The StreetPass games have a lovely magic to them. I refer you back to Mii Force and the idea that players' Miis fire different weapons depending on their shirt color. Perhaps you, the player, decide you like playing with orange-shirted Miis, because you like the orange weapon. You can either scheme with fellow 3DS owners to have them put their Miis in orange shirts before StreetPassing with you. Or, if you're like me, you'll simply ride the waves of surprise each day as you discover which shirt colors are being worn by the Miis you sucked up in a day of StreetPassing. There's a serendipity to this and a delightful bit of surprise. All four of these games take advantage of the surprises of social gaming, of the quirks of who you pass by on a given day. In time, you'll find that you pass certain people more often and pick up certain shirt colors or armies of a certain common size. You get entertained by a limited randomness that feels different than what you'd feel if you were playing games against a computer or with people who were consciously playing a game with you. These games taps into a desire I think that many gamers have: to connect with each other and to recognize that there are other people among the crowds outside who are also in the gaming tribe. Playing these StreetPass games doesn't just make you happy that there are other 3DS owners out there; it makes you happy that there are other gamers out there. This taps into a desire I think that many gamers have: to connect with each other and to recognize that there are other people among the crowds outside who are also in the gaming tribe. As popular as gaming is, it's still a fairly private affair. Many people who would happily talk about movies or music over dinner won't talk much about games. It's a more low-profile pastime. It's a somewhat more secret indulgence. StreetPassing plays with that by silently connecting gamers together. I might be standing on a subway platform playing a 3DS game. When the StreetPass light on my system starts blinking, I know that a fellow gamer is nearby. Was it the kid getting dragged along by their mom? Was it the business lady who just got off the express? Was it a guy riding the local on the opposite track? I don't know. I just know there was a gamer nearby. Nintendo's StreetPass games are a celebration of that. Fueled by the Miis you import from nearby systems, these are games that thrive among a more or less secret society of gamers. At some point later this year or maybe next year, people will again call for Nintendo to stop making gaming hardware. And Nintendo fans or even Nintendo themselves will say that no, Nintendo needs to make hardware, that their games and their hardware depend on each other to create unique experiences. Much of the time, it'll be easy to dismiss that. But do remember the StreetPass games. Do remember how unusual they are, how bold they are and, more than anything else, how they are so very much Nintendo—so very much the Nintendo of 2013. 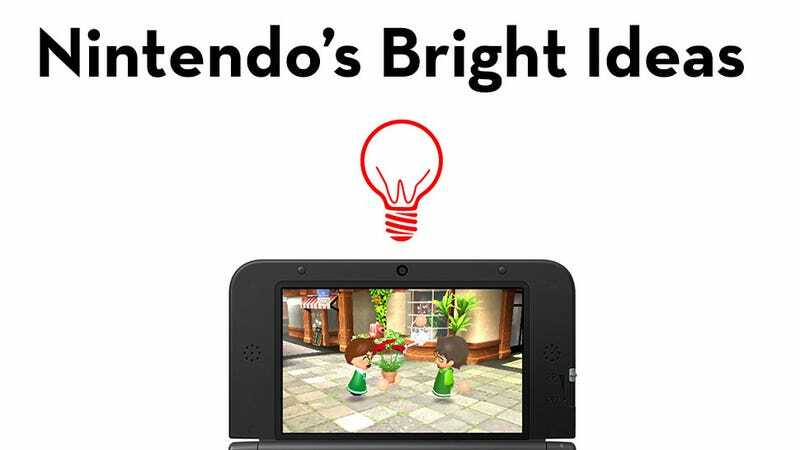 A couple of notes as well: 1) Since 2011 Nintendo's 3DS systems have included a primitive role-playing game called Find Mii, which is the original StreetPass-centric game. A sequel, Find Mii II is also baked into each system. Those games are simpler than Nintendo's summer quartet but they essentially started the genre that the diverse summer games explored. 2) The four games from this summer are produced and published by Nintendo but were actually developed by a handful of Japanese studios—Chunsoft, Prope, Good Feel and Grezzo—most of which have worked with Nintendo on franchise games before. They deserve credit, too. So take a look at how these games work. We shot these videos earlier this summer when the games were newer to me. I've played each of these games regularly since then. And I must confess that they've caused me to proselytize about 3DS StreetPassing to co-workers who own the system. Nintendo's plan is working!